When reviewing your Back Office, you may want to filter your sales history. To do this, select the data you would like to review in the left-hand sidebar under Analytics. You will then see an overview of your data. To filter this, click on the filter icon on the top right of the data window. A new right-hand sidebar will appear. Here you can select which data to display in your screen. 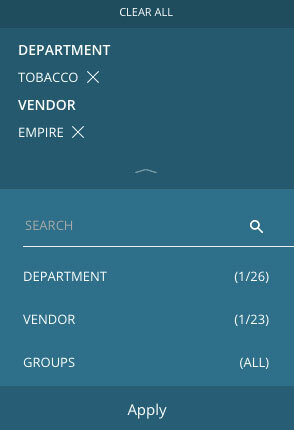 Click on Department, for example, to choose the departments which you would like to display. 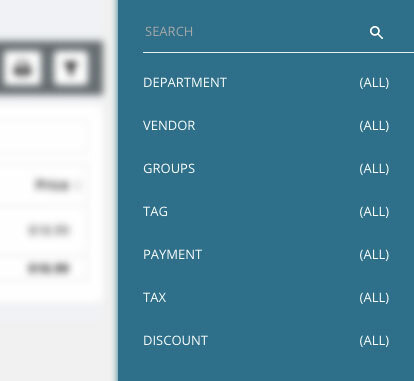 You can select as many filters as you need from departments, vendors, groups, tags, payments, taxes and discounts. Once you are finished, you will see the selected filters at the top of the sidebar window. Click Apply at the bottom of the sidebar window to save the settings. Click on the filter icon again to return to your main menu, and view your filtered data. Click here to learn how to print this data.